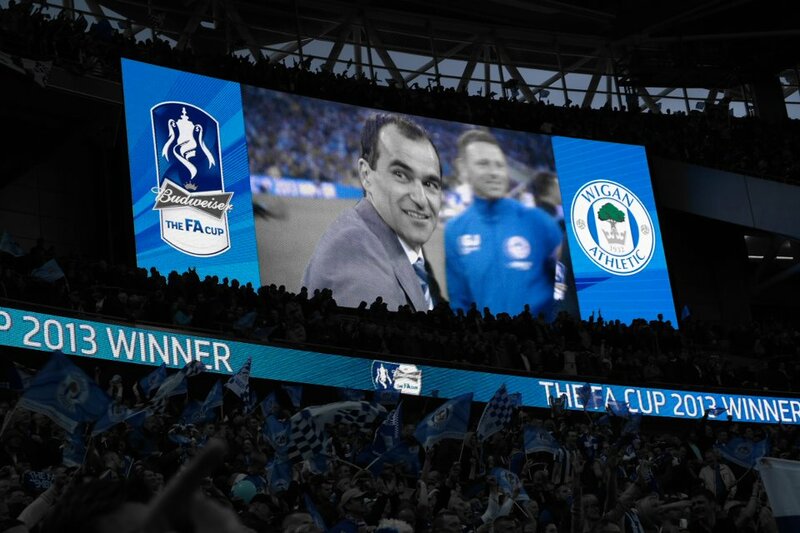 A dream come true – Wigan win the FA Cup! The greatest performance in Wigan Athletic’s history saw an incredible victory through substitute Ben Watson’s 91st minute header. This was no fluke – Wigan played the better football and were deserved winners. Just over three weeks ago Latics had gone to Eastlands and had been the better team. That day the result went against them. Today they got what they deserved and left Manchester City shell-shocked. Latics had been buoyed by the return of the excellent Antolin Alcaraz, joining Emmerson Boyce and Paul Scharner in the centre of defence. The end result was real solidity at the back – enough to keep out City’s talented forwards. Roberto Martinez pulled off a tactical master stroke by fielding James McArthur at right wing back. He was a revelation. On the other side Roger Espinoza played with enthusiasm and no little level of skill, given the protection of the back three behind him. Many Latics supporters had expected Martinez to bring back Ali Al Habsi, but he stuck with Joel Robles, who saved the game for his team with crucial interventions. Wigan played controlled, skillful football throughout and once again made City look ordinary. Gael Clichy had an horrendous time coping with the pace and directness of Callum McManaman and Arouna Kone gave the City central defence a torrid time. James McCarthy and Jordi Gomez worked hard in midfield and Shaun Maloney showed what a high class player he is in the creative midfield role. Given the sheer bad luck Latics have faced in the closing minutes against top teams, one was dreading a last minute goal from City. The turning point came when Pablo Zabalata was sent off after 84 minutes following a foul on McManaman, his second yellow card in the match. The tide had turned and one started to see the game going into extra time, with City’s ten men starting to look ragged. Watson spared Wigan the extra minutes with a well taken, opportunist header. A wonderful win that brought tears to the eyes. Few would have believed that this dream would come true – except maybe Roberto Martinez! Huge credit for this victory must go to manager, Roberto Martinez. He out-thought the highly experienced and successful Roberto Mancini. Wigan played to their strengths and did not allow Manchester City to play to theirs. Martinez’s tactics were spot-on. Martinez refused to panic, given the horrendous injury situation he faced. He had the foresight to put two central midfielders into the wing back positions and it came off. He was to make what turned out to be probably the most inspired substitution of his career, bringing on match winner Ben Watson after 81 minutes. Latics played without fear, despite the star-studded lineup Manchester City put out. Once again great credit to the manager for motivating his players, following the horrendous midweek defeat to Swansea. Joel Robles: 9 — An outstanding display from the young Spanish keeper, making several superb saves. His last ditch save from Carlos Tevez in the first half was crucial. Emmerson Boyce: 8.5 — The admirable captain’s best performance in a central defensive position. Antolin Alcaraz: 8.5 — His return made a huge difference to the defence. An excellent performance. Paul Scharner: 8.5 — His best ever match for Wigan in the centre of defence. Showed great technique and concentration. James McArthur: 8 —Did a great job in adapting to the wing back position. Full of heart and determination, with no mean level of skill. Roger Espinoza: 8 — Full of running and enthusiasm. A key player for the future. James McCarthy: 9 — Excellent as always. Bossed the midfield. Jordi Gomez: 8 – Worked hard and covered a lot of ground. Substituted after 81 minutes. Shaun Maloney: 8.5 – Once again looked a class act. Constantly probed the City defence looking for openings. Callum McManaman: 9.5 – Maturing into a very fine player. Full of confidence and his direct running was a constant headache for Clichy and the City defence. Arouna Kone: 8.5 – A high class centre forward: strong, fast, intelligent. Played a key role. Ben Watson: — Not long returned from a broken leg and scored the winner at a Cup Final. That will be something he will remember for the rest of his life.